Balsamic Cobb Salad has become a staple in our house. It’s not unusual if I make this salad 3 times in one week. It is THAT GOOD. Also, it is that filling! Stop eating salads that leave you hungry. (Post dinner snacking is the ultimate sabotage!) The good fat from the bacon and avocado balance the nutrient dense vegetables and protein rich chicken. These flavors are soul sisters for sure. They are just meant to be together. Now that being said, this salad is also good with shrimp, salmon, and steak. Which also makes it crazy versatile! Enough small talk, let’s get down to business! 1/2 cup of Rachel’s Chicken Marinade. Follow this link for the recipe! 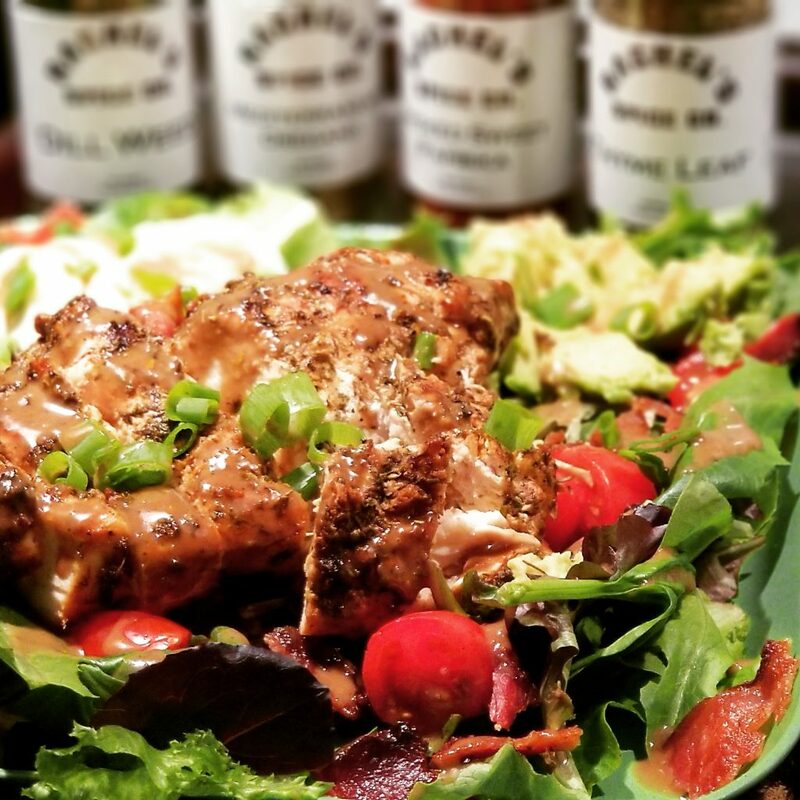 1 cup Honey Balsamic Vinaigrette Follow this link for the recipe! Follow instructions for Rachel’s Chicken Marinade to flavor chicken. Grill chicken over medium high heat, brush grates with oil before placing chicken. Cook 5 to 8 minutes each side or until juices run clean and internal temperature is 165°. Check out my blog on meat temps! When chicken is done, set aside to cool so it can be sliced. In a large salad bowl combine greens and tomatoes. When the chicken is cool enough to be handled, slice each breast into thin slices. Divide the salad among 4 plates, top each with 1/2 avocado, 1 egg, bacon, and 1 sliced chicken breast. Serve with Honey Balsamic Vinaigrette. I cannot eat cheese so I don’t tend to make recipes with cheese; selfish I know! However, if I could eat cheese on the regular, I would use Gorgonzola on this. I think it would marry beautifully! You don’t have to grill the chicken; you can bake it in the oven, cook it in a cast iron pan, however you prefer! Don’t be afraid to add more veggies! I often add whatever is in the fridge, cucumbers, peppers, mushrooms, onion…. load it up!